Acer rubrum is commonly known as the Red maple, and also called Swamp Maple, is widespread, from Southeast Manitoba, East to Newfoundland, to South Florida and Eastern Texas. In nature, it is a tree to 90 feet, usually smaller. It tolerates ozone and is somewhat tolerant of sulfer dioxide, making it a good tree for urban areas. 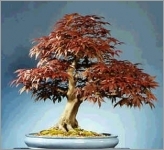 Great bonsai specimen. Young trees are often pyramidal or elliptical and are fast growers with strong wood. Older trees develop ascending branches, resulting in an ovoid or rounded crown. The bark of Acer rubrum is tender and scars easily. The leaves are opposite, 2 to 4 inches, quite variable in shape, 3-5 lobed; dullish green, with usually reddish leafstalk. They turn brilliant red in Fall. The flowers are small, showy, red and begin to bloom in late Winter or early Spring and bloom through March. The fruits or seeds are also red, and are winged. They occur in great profusion in late Spring and early Summer.